Ventriloquist Steve Bernard shows his hilarious abilities that have wowed audiences on both sides of the Atlantic for decades. Since beginning his career with Ringling Bros. & Barnum & Bailey Circus, in 1981, Steve's been pretty busy. He's gone on to perform for countless corporate functions, appeared on numerous international television shows, and made over 70 TV commercials in six languages! His resume also includes appearances at comedy clubs nationwide, college campuses, and lots of experience entertaining on cruise ship lines such as Norwegian Cruise Lines, and Holland America. Steve makes every performance unique by personalizing each show, using information about the company's product or service, and making the audience go wild while having fun with some the key people. Steve definitely offers one of the most unique comedy shows anywhere. 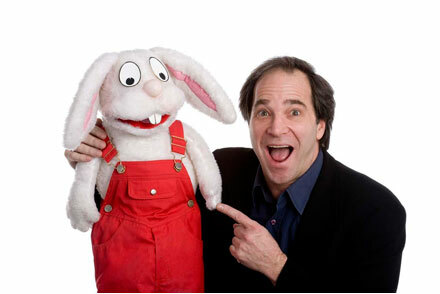 Even if the puppet is the crowd favorite, Steve is proud to work with Jack, the world's only juggling and fire-eating rabbit. Make your next function something to remember with Steve and Jack! Each show is a success!